While the pace of the present day can cloud the vision, casting out our gaze to the future allows a bigger picture to emerge. 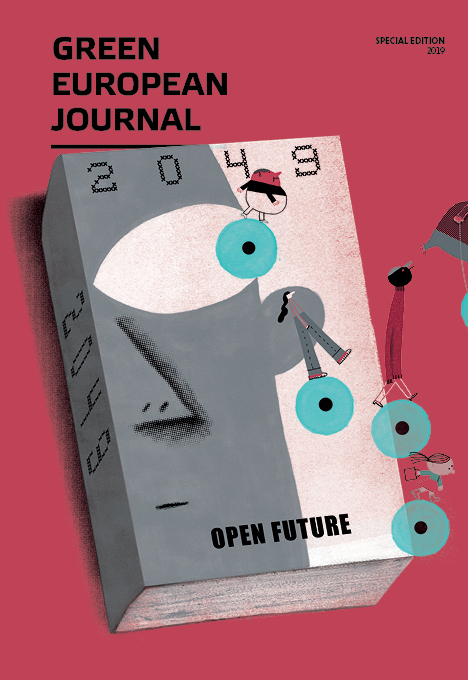 Beyond any one theme, this edition looks forward to imagine the Europe(s) to be in 2049. It will be a new era, shaped by people from current trends, institutions, emissions, and waste. From the evolution of the internet and the ongoing reinvention of monetary systems to landscapes – geopolitical and natural – and everyday routines shaped by the climate crisis, this collection of essays, stories, and interviews, complemented by infographics, seeks to capture life and society in 2049. With this special edition, the Green European Journal contends that the politics of tomorrow start with the politics of today. If we can envisage, design and embrace a brighter, open future, we just might get one too. Neither an academic nor a policy foresight study, this edition is presented with the aim of thinking about the future to make the present a better place. It was made possible thanks to the amazing work of the editorial team and board, as well as all the Journal’s partners, and was realised in cooperation with the Heinrich-Böll-Stiftung European Union. Under the leadership of foreign policy chief Sofia Belver-Tamarashvili, the European Republic becomes a global force for social and environmental justice. A Eurozone expert envisions how a new monetary policy – changing the way we pay, save, tax and spend – could fix the contradictions pulling Europe apart. An interview with Rosi Braidotti, philosopher, reflecting on technology, inequality and the politics of life itself in a world of artificial meat and surveillance capitalism.